I remember at one point in my childhood, it seemed like all the cakes, snow globes, and fairy tale books were decked with these fancy brick houses that made me had my first impression or expectation of how a European village looks like. Around twenty years after, I stumbled upon this friendly village of Bruges in northern Belgium where everything screams fairy tale setting, and that huge expectation suddenly became a reality. The only thing lacking are sparkly fairies, but who needs one when the smell of freshly baked waffles and heaps of delectable pralines make you preoccupied as you saunter along the cobblestone walks of the old town? Bruges is definitely the stereotypical European village for a non-European. The well-preserved brick houses outlined by a typical Flemish architecture lining the narrow waterways remind you of the lifestyle of days bygone. I fervently recommend everyone to try the canal tours which bring you to the navigable canals and tiny vine-wrapped romantic bridges that offer a different perspective of the city. 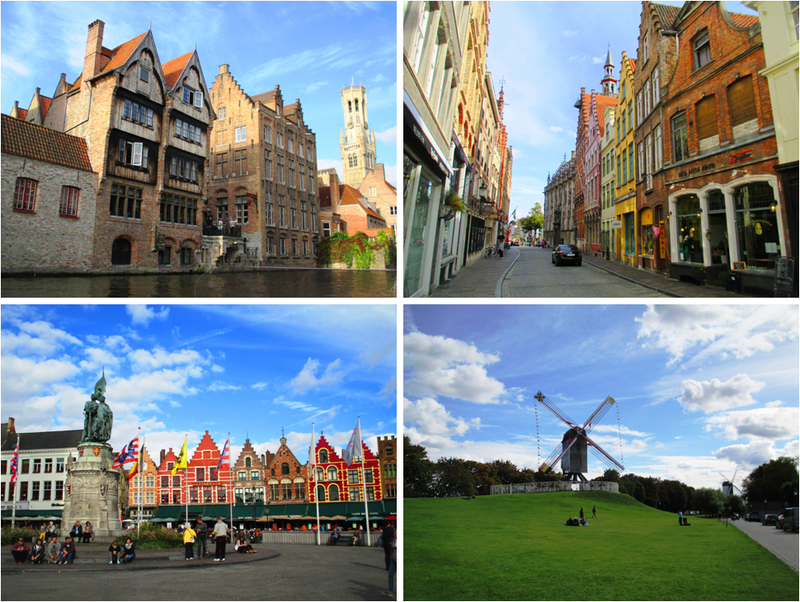 Clockwise from Top Left: A view of the old houses and the prominent Belfort medieval bell tower from afar during the river cruise, a commercial street lined with shops which sell crafts, chocolates, and various merchandise, one of the windmills at the edge of the city, and the famous Bruges Market Square which is probably a delight at Christmas time. After all, Bruges was one of the most important cities in Europe during the medieval period with its strategic location near the sea, apt for trade and commerce. Losing much of the economy to Antwerp, the city’s prominence dwindled henceforth; however, the charm of the ancient city was kept and remnants of the old lifestyle that once had teemed in this golden city are still very evident. Of course, chocolates, beer and waffles are omnipresent in Bruges being a Belgian city which adds more vibrancy to its already appealing facade. Lace is also still being sold as souvenirs with Bruges being once known as the home to the best weavers and lace-makers in Europe, if not the world, during its prime. Bruges, I think is best admired from the outside so walking around is indeed very fulfilling. There are also windmills by the north-eastern edge of the old town center which also have amazing views of Bruges’ skyline. By the windmills is also a stretch of green grass field ideal for some picnics and a lazy afternoon nap. Bruges is indeed a comfortable escape from the hustle and bustle of the highly industrialized Belgian cities and something to really not miss when you happen to drop by the Flanders region. I’m so gutted I didn’t have the chance to enjoy a canal tour when I visited…will definitely have to try one next time! Hi Becky! Yes, you definitely should. It was awesome especially on a sunny day. And not very expensive at all.